While the world continues to wet its pants every time another Google Glass tidbit flutters into the echo chamber, Epson has quietly been shipping its own retail face wearable to consumers. The first-generation Moverio smartglasses were somewhat raw, but on Tuesday Epson announced retail availability for the second-gen Moverio BT-200. They cost $700, and can be purchased at Epson.com. Google is positioning Glass as a mainstream product with broad consumer-focused applications, but Epson is aiming the BT-200 toward the enterprise space. In a product demo late last month, I had a chance to play with the new Moverio glasses for a second time, and everything Epson showed me was geared toward using the smartglasses in a work setting. One demo showed off the smartglasses' edge-detection abilities: With the BT-200s on my face, I stared at a photograph of an air conditioning unit (a photograph, it turns out, can be an effective proxy for actual hardware). The glasses recognized the outline of AC unit, and up popped an augmented-reality overlay of the hardware's internal parts. If I were a technician in the field, I could then use that overlay schematic to assist my repair job. Another demo showed off the Moverio's utility in an automotive showroom sale environment. Wearing the BT-200s, I gazed at a photo of an interior of a new car. As I targeted various dashboard features with the glasses' centering reticule, up popped snazzy information overlays, providing a virtual tour of the car's bells and whistles. Relative to the first-gen Moverio, the new BT-200 model boasts a larger, brighter screen, yet is 60 percent lighter. There are also new motion sensors for better head-movement tracking, and a new front-facing camera. An updated touch pad control unit boasts a faster processor, but the glasses themselves are as geeky-looking as ever (though aesthetics shouldn't be a problem if you're wearing these smartglasses at work--unless you're wildly vain). 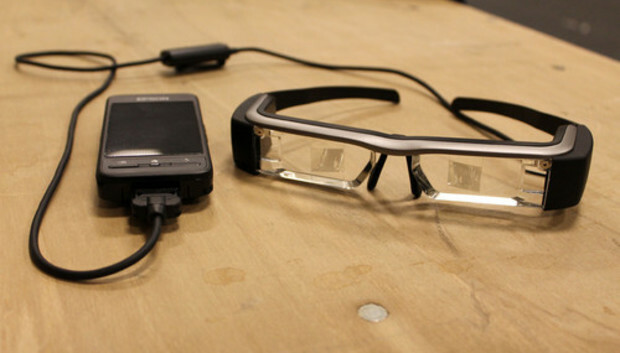 The Moverio BT-200s may not be as glamorous as Google Glass, but they're real. And they have also beaten a number of other smartglasses to market, including the enterprise-focused XOEeye XOnes, which I covered last month. Stay tuned for a full review of Epson's second-gen face computer.